Join us during sugaring season for complementary guided tours of the sugarhouse, samples of fresh maple syrup, maple cotton candy, freshly baked maple cinnamon rolls frosted with maple cream, and maple sugar on snow. See the maple sugaring process from our trees to the jug you take home for your family to enjoy! Open both days from 10 am to 4 pm. We are guaranteed to be boiling both days over a roaring woodfire. Participate in Poultney’s Maple Fest, on Saturday only, with pancake breakfast, 5K run, scavenger hunts, horse drawn hay rides, maple themed dishes at local restaurants, fill a bag sales at participating merchants and much more! Some of the finest maple syrup Vermont has to offer comes from our mountainside sugar maple trees. 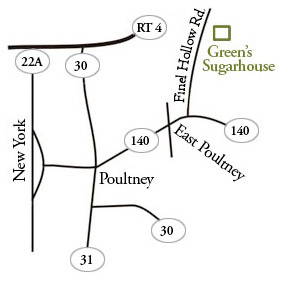 Green’s Sugarhouse is nestled in Finel Hollow, where our ancestors settled in 1774. The tradition of maple sugaring has been passed down through our family for six generations. The result is our delicious award-winning syrup.